We offer you the interesting interview which Alberto Zampino granted us for our Storcicom XII. An overview from how the pasta factory was born, how the partnership with Storci has evolved, until the projects for the future of the Gragnano's Company. 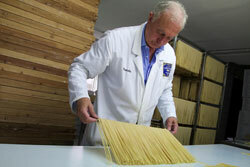 In the images below, Natale Zampino and Pasquale Zampino at work in the pasta factory. 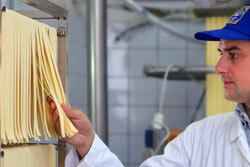 Could you tell us the story of your pasta factory? Our story started in the eighties in Via Pasquale Nastro in Gragnano, worldwide famous town for pasta production. Our father, Natale Zampino, took over a small pasta factory that was producing only handmade fusilli, a shape that has been our distinctive feature during the years. At that time, it was pretty hard sticking to traditional rules and preferring the Cirillo Method that requires a slow drying process; nonetheless Natale knew that all his initial efforts to start up the factory fully respecting past traditions, would have been rewarded. How much is craftmanship important for your product? And how much does the choice of raw material weigh on the production? The choice of raw material and craftmanship are two equally worthy aspects: the slow drying could not be possible without a dough prepared using the best raw material. Why did you choose Storci? What are their features that impressed you most? After evaluating which Company was the best for us, we all agreed to choose Storci for the ability to combine cutting-edge technology with craftmanship. Pasta makers, Natale and Pasquale, have found in Storci the professionalism they were seeking: a clear proof of this are the presses customised meeting our needs and requirements. Eventually we do not forget the strong friendship between our family and Storci. What are your next projects and what could Storci do for you? In future we would like to go on focusing our attention on the quality of the pasta and looking for the excellence, trusting that Storci will always offer us technologies able to enhance all pasta features, just as they have done so far.